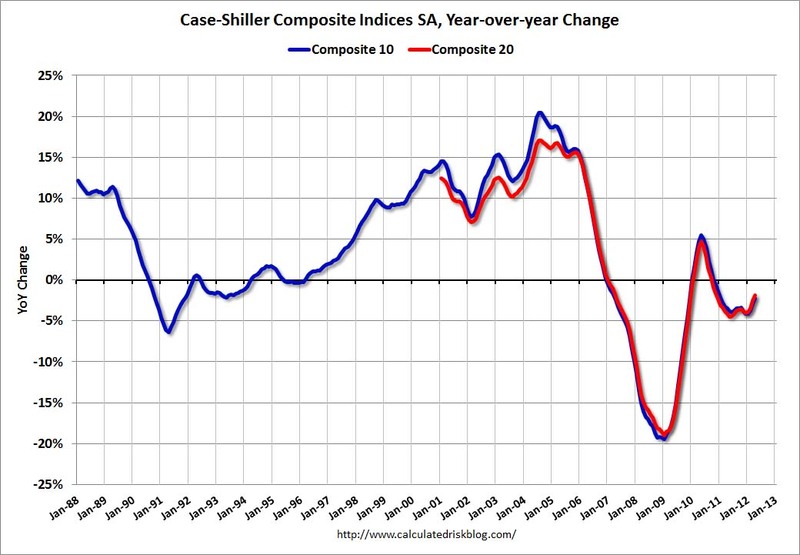 S&P/Case-Shiller released the monthly Home Price Indices for April (a 3 month average of February, March and April). This release includes prices for 20 individual cities and two composite indices (for 10 cities and 20 cities). 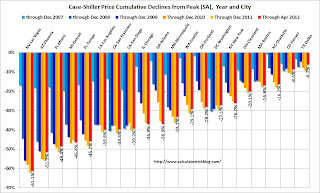 Data through April 2012, released today by S&P Indices for its S&P/CaseShiller Home Price Indices ... showed that on average home prices increased 1.3% in the month of April for both the 10- and 20-City Composites. 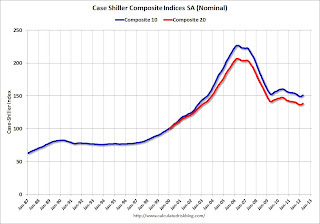 This comes after seven consecutive months of falling home prices as measured by both indices. “With April 2012 data, we finally saw some rising home prices,” says David M. Blitzer, Chairman of the Index Committee at S&P Indices. “On a monthly basis, 19 of the 20 MSAs and both Composites rose in April over March. Detroit was the only city that saw prices fall, down 3.6%. In addition, 18 of the 20 MSAs and both Composites saw better annual rates of return. It has been a long time since we enjoyed such broadbased gains. While one month does not make a trend, particularly during seasonally strong buying months, the combination of rising positive monthly index levels and improving annual returns is a good sign. The Composite 10 index is off 33.3% from the peak, and up 0.7% in April (SA). 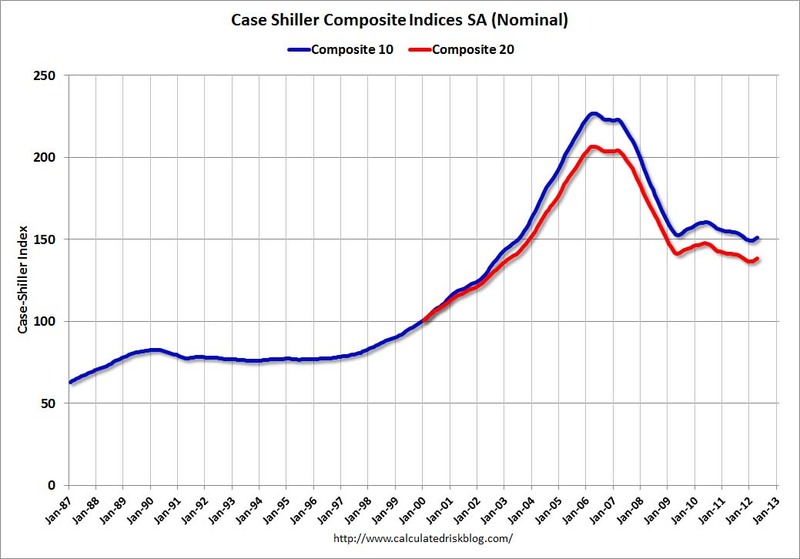 The Composite 10 is up from the post bubble low set in March, Not Seasonally Adjusted (NSA). The Composite 20 index is off 33.0% from the peak, and up 0.7% (SA) in April. The Composite 20 is also up from the post-bubble low set in March (NSA). 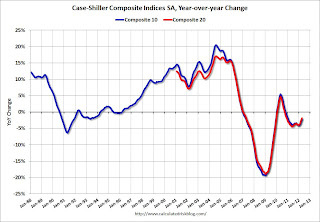 The Composite 10 SA is down 2.2% compared to April 2011. The Composite 20 SA is down 1.9% compared to April 2011. This was a smaller year-over-year decline for both indexes than in March. 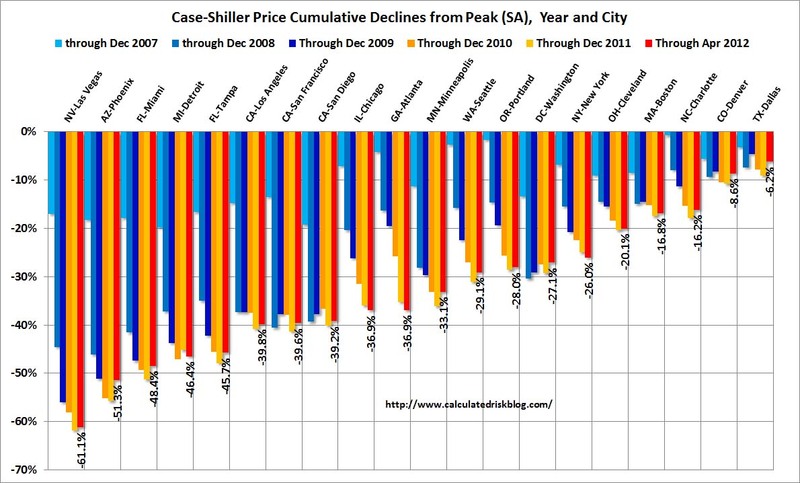 Prices increased (SA) in 17 of the 20 Case-Shiller cities in April seasonally adjusted (18 cities increased NSA). Prices in Las Vegas are off 61.1% from the peak, and prices in Dallas only off 6.2% from the peak. Note that the red column (cumulative decline through April 2012) is the lowest for only a couple of cities. This was better than the consensus forecast, and the NSA indexes are above the post-bubble lows set last month (NSA). I'll have more on prices later.